Ready for yet another confession?? We received a crock pot for a wedding gift 5 years ago and I have never used it, not once. I have nothing against crock pots, but normally I just cook things in my LeCreuset pots. So when crock pot contacted me and asked if I wanted to participate in a crock pot cooking contest, I immediately thought, yes! It was the perfect nudge to inspire me and get me using my crock pot. Crock Pot recently came out with 3 new seasoning packets (beef stew, pot roast, and BBQ) and the challenge was to create a recipe that used one of the seasoning packets. Easy enough, right? Let your imaginations run wild. Best part is the contest is still open and anyone can enter thru November 25th. If you have a fabulous crock pot recipe, just submit it here. The winner gets a years supply of groceries valued at $8500. I know I would be all over some free groceries. My first experience with the crock pot turned out amazing. Why did I wait so long to use this easy appliance. I tossed everything in around lunch and come dinner time it was perfectly cooked and I had nothing more to do than sip my wine. Here is the recipe Matt and I came up with. It is a mix between beef stew and chicken pot pie. Oh and it is truffled. This one decadent comfort food dish you will love! We decided to mix it up and use two seasoning packets in our dish. We loved the Beef Stew and Pot Roast mixes so much we combined them. I would say it was a genius idea. Best of both worlds. This is was so easy to whip together and super delicious. Here's to hoping I win:) You should totally make this for your family and enter the contest. Seriously though if anybody has great slow cooker recipes send them my way. I loved how easy it was to throw all this in the pot and then dinner was ready! SPREAD THE MEAT IN BOTTOM OF YOUR SLOW COOKER AND SPRINKLE WITH 1/2 PACKET BEEF STEW MIX AND 1/2 PACKET POT ROAST MIX. LAYER ON NEXT 6 INGREDIENTS. IN A SEPARATE BOWL WHISK TOGETHER CREAM OF CELERY, RED WINE AND WATER. SPREAD MIXTURE OVER BEEF IN CROCK POT. COOK ON LOW 8 HOURS. WHEN MEAT MIXTURE IS DONE STIR IN 3 TABLESPOONS FLOUR AND 3 TABLESPOONS TRUFFLE OIL. PREHEAT OVEN TO 425 DEGREES AND COOK PUFF PASTRY SHELLS 20 MINUTES. SPILT SHELLS INTO 2-3 PIECES. LAYER SHELLS IN BOWL AND SPOON BEEF POT PIE MIXTURE OVER THEM. DRIZZLE WITH TRUFFLE OIL AND GARNISH WITH FRESH PARSLEY. I will admit that it took me awhile to use our "wedding" Crock-Pot too. But now with three children in all different after school activities I use our's all the time. It is such a great time saver!!! So I am not one for crockpots, but this looks beyond amazing. Like high end food and it came from a crockpot. Still have to pinch myself on this one. Yummm. I will admit that I only recently broke out my crockpot that I received over 3 yrs ago for our wedding but I did not pull off my recipe corrently- I will have to try this one for my husband! That sounds amazing! I love my crockpot and try to use it at least 1x/week these days. I haven't tried those new spice packets, but will definitely try your recipe with them! I have a "Crockpot Creations" board on pinterest if you want to look through those recipes.... Good luck with the contest! Sounds and looks like a winner! I'm in college and a crockpot would be perfect to add to my apartment wishlist! I think croc pots are great for a carnivorous meal, but vegetarian meals would be cooked beyond recognition. But soup works. Your meal looks delish! Pulled pork is a cinch too. 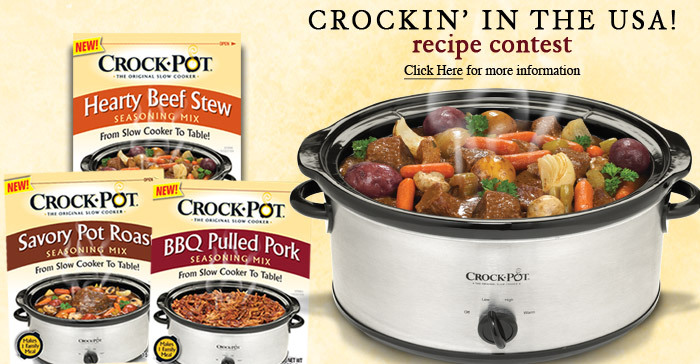 This looks desish and crock pots are ah-mazing. I never bought one because I'm not one for big pot of mush type meals. But then I realized its really just a way to cook anything without having to stay home for fear of leaving your house with the oven on. I just throw chicken and some spices in mine all the time now and set it for 8 hours so we have cooked chicken to make anything for dinner at night. You are such the martha steward my love! Sounds so good! I always make pulled pork in the crock pot. I just use pork shoulder and the McCormick seasonings packet following the instructions. It could not be easier. I always eat mine with cole slaw on the bun too. Yum!! We actually use our crock pot pretty often! I will get some recipes together and send them your way! I've made pulled pork, beef stew, apple crisp and all sorts of things in it! It's great for just throwing things in and then dinner is ready when you get home! Your recipe sounds delish! I'm always looking for good crock pot recipes -- trying this this week! oh the crock pot is the best invention ever! I use it all the time to make taco meat--as much as yall eat tacos, you should too! i just put in three chicken breasts, a bunch of random mexican spices (cumin, garlic salt, red pepper, etc) and then a jar of salsa, can of black beans (rinsed) and corn (rinsed). Set on low and cook for 8 hours, then the chicken shreds really easily. You can also add in cheese, but I'm lactose free so I leave that out. The filling is AWESOME on tacos, taco salads, burritos, etc. Try it! Mmm I need to get some truffle oil! This looks fantastic!! this looks delish and so simple! I need to get my hands on some goddamn truffle oil STAT. I couldn't live without my crock pot, especially now with Pinterest and it's the winter, so many awesome recipes floating around there to try out! I just made an awesome potato soup as well as beed stroganoff this past weekend, both were hits!! Oh that looks soooo good!! I love my crocpot (just started using it in the last year). I bet I use it at least once a week. I hope you win!! I use mine to cook dried beans. It's perfect and way cheaper and tastier than canned. looks awesome! I really need to get some new crockpot recepies! and beautiful, structured coach designer handbags are recommended in solid colors that fall to your middle. hermes bag outlet For the hourglass figured girls, you know you can carry any designer louis vuitton monogram canvas and look like a goddess.